At A-List Limousine, our goal is to ensure that your night is amazing–even while getting to and from your destination. Our limousines and party buses feature state-of-the-art technology, comfortable interior and futuristic lighting, which all help to create the most fantastic party atmosphere that you and your guests will be sure to enjoy. Our wedding packages offer classic elegance that will make you and your 'spouse-to-be' feel like a King and Queen on your special day! Getting you to your destination safely and on-time is our top priority. A-List Limo is a respected, customer-driven company that strives to exceed your expectations in all aspects. Need a few more reasons? No problem! 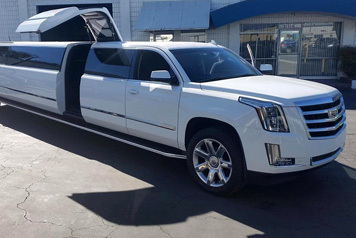 Let us handle the headache of transportation on your day or night out, while you enjoy one of our limousines, party buses or custom vehicles and make memories that will last forever. We are open seven days a week. Call today with any questions you may have or to get a free quote with the best limousine service in Metro Detroit! The contents of this webpage are Copyright © 2019 A-List Limousine. All Rights Reserved.